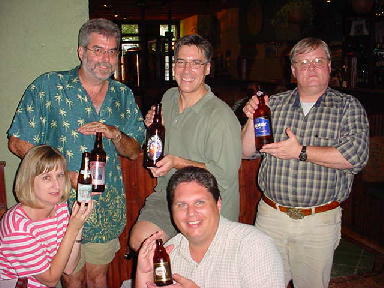 Owen Ogletree (director of Brewtopia Events) gathered together some of his fellow beer lovers in the summer of 2001 at Athens' Burntstone Brewhouse to sample and comment on several Belgian Trappist-style Dubbels (Doubles) and Tripels (Triples). This beer sampling was done as a blind tasting where each style was revealed, but no one was aware of the brand that was being served each time. Beers were informally commented upon and ranked according to American Homebrewers Association (AHA) style guidelines. This sampling was conducted in July, 2001. First, second, and third places (best of show) were awarded to the beers we felt represented their styles in extraordinary fashion. Drop Owen an email to share your comments and opinions. (L to R): Gail Graves, Dean Graves, Don Beistle (top), Thel Melton, Lari Cowgill, and Owen Ogletree (not pictured). We'd like to thank Burntstone Brewhouse for hosting us! Rich malt aromas are typical; many dubbels have raisiny and other fruity ester aromas. No roasted malt aroma. Some higher alcohol aromas (peppery, spicy) are common. Mild to moderate clove-spice aromas may be present. Hop aroma is faint to none. No diacetyl (butterscotch). Dark amber-brown in color. Clarity is usually fair to good. Head retention may be adversely affected by alcohol content in stronger versions. Rich malty and fruity flavors bring the balance toward malt throughout. Some examples are malty, yet dry; raisin flavors are common. A slight to moderate clove spiciness may be present. Hop flavor is low to none. No diacetyl. Medium to full body. Warming mouthfeel from alcohol. A dark, rich, malty, moderately strong ale. Complex with malt and fruity esters, which may have a citrus-like essence, and often a mild to moderate clove-spice character. Hop aroma may be moderate to none. No diacetyl (butterscotch). Pale gold to deep gold in color. Clarity is fair to good. Head retention may be quite good or may be adversely affected by alcohol content in some versions. Crisp and moderately fruity. Malty sweetness is balanced by restrained hop bitterness and high carbonation to provide a dry finish to the palate and a sweet aftertaste. Clove-like spiciness is apparent in many examples. The best examples have subtle alcohol undertones, while others may have noticeable alcohol presence. Hop flavor may be moderate to none. No diacetyl. Medium body, although a light impression (thanks to the candi sugar) given the often substantial original gravity. High alcohol content adds a warming sensation. Carbonation is very high and effervescent in character, yet ideally does not disturb the beer's smoothness. A pale, moderately fruity, spicy, very strong ale. A wonderful ale with a citrus essence and a sweet, clove-like, fruity, perfumy character. There are nice hops here too and a definite warming alcohol character. The high carbonation level is good. A Tripel does not get much better than this. A very rich ale with perhaps a bit of off aroma (vegetal?). The flavor is outstanding with clove, spice, hop, and citrus character. This beer is deep gold with a good head retention. Malty sweetness is balanced by the dryness of the hops and high carbonation. A very nice, thick, smooth mouthfeel. A fruity, strong ale that is delicious. This beer is loaded with complex, earthy, fruity, cellar character. There is a beautiful note of pepper and spice. Seems to have a great deal of alcohol for a Dubbel (ed. note: some would agree that this beer is a bit too strong to fit the Dubbel style). Medium/full body and mouthfeel with a rich, malty flavor. This is the darkest beer in our sampling group -- quite flavorful. This is a tasty beer, but there is not enough raisiny, fruity complexity. A hint of butterscotch is there along with a touch of roasted character (not appropriate in a Dubbel). Medium amber brown in color, this ale has a good clarity. We all loved this beer, but the roast and caramel undertones make it not a perfect Dubbel. There are banana esters here and some plastic-like phenols. This bottle could be old. Not a very complex ale. Head retention is good. Mouthfeel is nice. There needs to be more malt and more complexity here. This ale has an aroma more like an Old Ale or a Barleywine. This bottle could be past its prime. The flavor is of caramel, sherry, and a touch of diacetyl (butterscotch). It is medium brown in color with a nice head. This bottle leaves a hint of insipid, sherry-like aftertaste. Beautiful pale gold color and good, creamy head. The aroma is like caramel or cotton candy. Flavor is a bit tart at first and then seems more sweet and clove-like. There are very little hops. This is a good beer, but seem to have some esters of a Bavarian Wheat beer (bubblegum and banana?). With a few changes in character, this could be a Tripel. This is an ale with a Belgian White Beer character. There are hints of acid, citrus, and coriander spice? The aroma is light. The flavor is fruity, but not very crisp. There is creamy carbonation. There is an alcohol flavor here, and the beer seems to be a bit out of balance (needs more crisp hops). Mouthfeel is thick. A tasty, interesting beer, but not a great example of a Tripel.